The machine frame is manufactured with advanced technology with very precise tolerances and stress relieved with large welded components. All tensile points are designed with large radii and strain accumulation and possible welding cracks are eliminated. The lower and upper tables’ inertias are designed for optimum value for minimum deformation. The top plate is designed to be positioned vertically so that the roller bearings, piston bearings and felts can compensate for vertical loads. The hydraulic cylinder is designed as double-sided and honed to a surface quality of 2 microns. Thus, minimum wear resistance is created for the felts. The cylinder bodies are manufactured as SAE 1040 material forged. The hydraulic cylinders are bolted to the front of the feet with bolts and cams to provide excellent leveling and load balancing. Piston head features: Omega-type felts are fi tted with wide bronze bearings, semi-angled sleeves. The pistons are precision ground and hard chrome plated to provide low friction and abrasion resistance when the piston passes through the felts. The adjustable top tray slides are made from materials that are suitable for very low friction resistance. These beds are arranged for guiding to move the top table from right to left and front to rear. 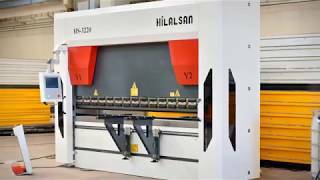 The Hilalsan hydraulic system allows precise usage at all pressure values up to the maximum operating pressure. At the same time, with these pressure values, precise cylinder positioning, synchronization and repeatability are achieved. Backgauge system is manufactured in accordance with environmental conditions. Backgauge bearings are made for heavy conditions with double bearers. Scrapping type bearings are used against dust and other particles that will accumulate in the linear guideways against dusty environmental conditions. The outer surface of the machine is painted with two layers of paint at least 60 microns in thickness to protect against weather conditions. Paint drying is done gradually in diff erent time and temperature ranges in state-of-the-art ovens. Standart Y1, Y2, X axis. Cybelec Touch 8 Colored Touchscreen Control Unit. X Axis Back Gauge with Servo Motor & Drives. Including 2 pcs Back Gauge Finger Blocks. European Type Top Tool System. European Type Top Tool (110/75deg/h66 mm or 110/75geg/h105 mm). European Type Bottom Tool 4V H:60x60mm. Sliding Front Support Arms (2 pcs). Foot Pedal with Emergency Stop Button. X1, X2, R1, R2, Z1, Z2, X5, X6 Bacgkauge Axis Options. Hilalsan Type Multi V Bottom Tool Options. WILA Type Top Tool Hydraulic Clamping System. WILA Type Bottom Tool Hydraulic Clamping System. Top and Bottom Tool Options. Special Full-sized housing (machines for 3 to 4 meters). Advantages of crowning to achieve a constant angle. 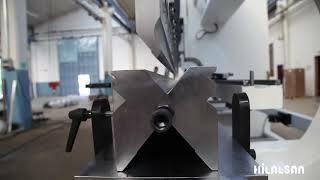 A press brake’s bending precision is eff ected by the deviations of the upper and lower table as well as other factors. Press brakes deviate from the opposite direction. In fact, penetration of the force obtained into the tool is not constant and the angle is not the same over the length of the machine. Independent right and left axes (Y1 and Y2) are controlled by proportional valves and linear position control system. The crowning system distributes the bending force equally to each point of the bending part to ensure correct bending results. WILA Type Bottom and Top Tool Hydraulic Clamping System. The movement of the backgauge is operated by the CNC control unit in hydraulic press brakes. The high performance servo motors produced by Mitsubishi move the bearing axes. Precision parts are produced by these motors. The electrical circuit components used are Siemens, Telemecanique and Schneider brand products. The special design has very strong construction due to its strong mechanical structure and can withstand large loads. The backgauge finger blocks move on top of the double-rail and aluminum-plated top profile. These backgauge finger blocks are very sensitive and can be adjusted from any point. Easily adjustable front Laser finger protection with linear guideways and GIVI Magnescale. REXROTH Pressure and Air Filters. Manual or Motorized Central Lubrication. The top plate connections are mounted with double springs as well as spherical connection to the cylinders with double safety. The parallelism with the top plate can be adjusted more precisely and the proportional valves can work synchronously with each other. 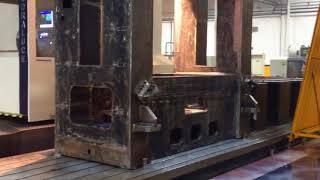 The press brake bodies machined in 5 Axis CNC machines are able to make more precise bendings and to reduce the friction coefficients to minimum level.